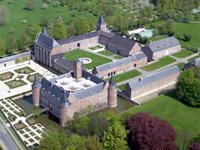 The enormous castle-abbey near the town of Bilzen is known as the Landcommanderij Alden Biesen (land commandership of Alden Biesen). It is said to be the largest castle between France's Loire River and the Rhine River. In the 11th century, the Count of Loon granted some land between Bilzen and Rijkhoven to some knights of the German Knights Order. This order took care of the wounded crusaders, and later also treated ill people. The present brick buildings dates from the mid-16th to late 18th century. In addition to the castle itself, there is a church, a gallery, an orangery and several other side buildings, as well as extensive and beautifully laid French-style gardens. 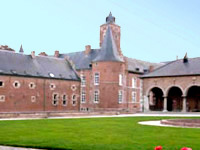 The castle became a private property after the French Revolution and is now a cultural centre of the Flemish Community. The castle was devastated by a fire in 1970, but was entirely restored. Alden Biesen is open everyday from 10am to 6pm (until 5pm from 1 November to Easter). Admission is 3 € for adults, 2.5 € for people between 12 and 18, over 60 or groups of 15 people or over, and is free for children under 12. A 3D map and 360-degree virtual visit of no less than 16 areas in and around the castle is available on the official website. 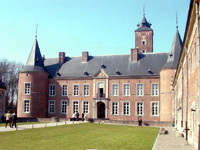 Alden Biesen Castle is located next the town of Bilzen, on the E313 between Liege and Hasselt. Take exit 31 for Bilzen Zuid, then the N700 for another 5 km. The castle's website has a very nice interactive access map. 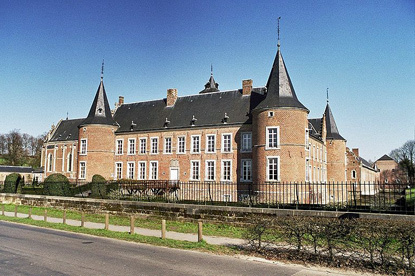 By public transport, you must first get tp Bilzen station (about 1h45min from Brussels, 45 to 50min from Liege or 13min from Hasselt), then get a bus or taxi for the remaining 5km to Alden Biesen.